Yes, I’ve been away for a bit, unexpectedly (though, G-d-willing, I’ll have a positive announcement soon about something major I’m doing in trying to fight the good fight). But now I’m back. Thanks to everyone who expressed their concern here and/or in e-mail messages to me. Your concern for my welfare and faithful readership are very much appreciated. Here are my reviews of this past weekend’s movies. (Soon, I’ll try to post some reviews of other movies I’ve missed posting this summer–“Hell or High Water” being the best by far and the rest being mostly crap.) Remember, you can always hear my movie reviews live, first thing every Friday morning on “The Pat Campbell Show” on KFAQ 1170 AM Tulsa at 7:35 a.m. Eastern, and on “The James Show,” on KWTX 1230 AM at 8:30 a.m. Eastern, on “The Larry The Cable Guy Show” (sometimes on Thursdays) between 10:30 a.m. and 11:30 a.m. Eastern on SiriusXM’s Jeff and Larry’s Comedy Roundup Channel 97, and on “The Mike Church Show” on the Veritas Radio Network/CRUSADE. You can also hear me many Fridays on “The Brett Winterble Show” on KFMB AM 760 San Diego usually at 7:30 p.m. Eastern (unless the Jewish Sabbath begins for me earlier). I do my movie reviews on all five shows, as well as some discussion of current political issues and pop culture topics. 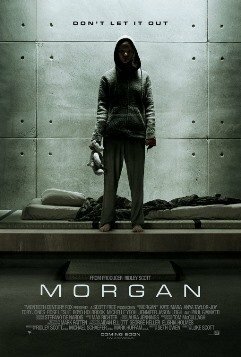 * Morgan – Rated R: I liked the idea of this, and I like most science fiction movies. It’s the execution here that is the problem, and this is one of the slowest, most boring science fiction films I’ve seen in recent years. When it finally gets going the movie is about five-sixths over. It’s not a tight script. Plus–and maybe this is just because I’ve seen too many movies so I can quickly cut to the chase in my mind–I figured out the “secret” of what was going on and who a main character really was, very quickly into the movie, before viewers are supposed to. I feel I’ve seen some elements of this movie–done far better–before, in movies like one of my faves of all time, “Blade Runner” (do we really need Blade Runner 2?!). The story: a woman (Kate Mara), who is a risk management specialist for an unnamed corporation, has traveled to a mansion in the countryside to decide on the future of the company’s “product.” That product, it turns out, is a synthetically created “human” named Morgan. Morgan (Anya Taylor-Joy) is a five-year-old girl, but she looks like she’s 16 or 17 and has superhuman strength and intelligence, both of which are constantly growing at a fast pace. Morgan is the latest synthetic human grown, developed, housed, and observed at the underground lab on the grounds of the mansion. Morgan is also very violent and has attacked one of her keepers. The keepers are a group of scientists, sociologists, doctors, and security personnel on the grounds. They include Paul Giamatti, Michelle Yeoh, Jennifer Jason Leigh, and several others. Not only did Morgan violently attack at least one of her caretakers, but everyone else is in danger from her, too. Only they don’t know it. Instead, everyone at the mansion–with the exception of the risk management analyst, who is strictly objective–is taken in by Morgan and thinks she’s just a harmless, misunderstood girl. It’s as if they all have Stockholm Syndrome. They make excuses for Morgan’s violent behavior, and they attempt to protect Morgan at all costs. What happens next is really the only part of the movie that is of interest. But it’s predictable and nothing we haven’t seen before (and done better). I could take or leave this movie. There was nothing offensive or objectionable about it. It just was a bore and not that exciting. Not even close. I feel asleep briefly during this movie and missed nothing. Not sure I’d pay ten bucks-plus to see this. It’s a “wait til it’s Netflixable” flick. The story: just after World War I (the movie takes place beginning around 1919), Fassbender–an Australian war veteran regarded as a hero–is offered a job manning a lighthouse on Janus Island off the coast of Australia. Tortured by his deeds in the war, he chooses that job as a form of repentance and self-served “pain,” which is weird because, um, who wouldn’t kill to have an easy job sitting at a lighthouse doing nothing and watching beautiful oceans? Fassbender meets Vikander through acquaintances at the lighthouse company, and they date. She proposes to him because, as everyone knows women especially proposed to men in 1919, didn’t they? Annoying feminist BS even when it doesn’t jibe with the time period. They get married, and Vikander is obsessed with having a baby with her husband. Alas, it is not to be, and she has two miscarriages. 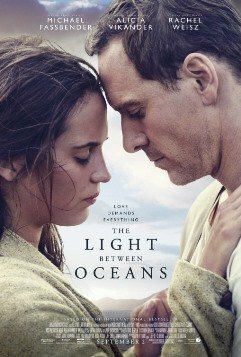 One day, after her second miscarriage, Vikander and Fassbender encounter a lifeboat with a dead man’s body and a live baby on board. Vikander wants to take the baby as her own and pretend that this is the result of her second pregnancy (rather than the miscarriage). Her husband wants to tell the truth and report both persons to the lighthouse company on the mainland and to police. But the wife pressures the husband, and she prevails. They raise the baby girl as their own. When the girl is four years old, Vikander and Fassbender meet the real mother of the child, a tearful and melancholy Rachel Weisz. Fassbender pressures his wife to turn the baby over, but she refuses. Instead, they remain silent. Soon, however, hints of the baby’s survival are sent to its real mother Weisz. Of course, it all ends up with everyone’s life being ruined–all too predictable. Who the heck wants to pay ten bucks-plus to see that? The rest of this movie, like what went on before, is long, slow, and incredibly boring. This movie clocks in at 132 minutes for no legitimate reason. It’s the conceit of the director (Derek Cianfrance, who also helmed the equally dreadful bitter romance, “Blue Valentine”–read my review) to think that we need much more than two hours of this high-quality Gitmo-torture-material cinema, when we need far less. The somewhat/semi “happy” ending doesn’t make it any more bearable. One-hundred-and-thirty-two minutes of your life you’ll never get back. Skipworthiness extraordinaire. * Equity – Rated R: I had mixed feelings about this movie. On the one hand, it’s a great illustration of what happens in an initial public offering (IPO) of a company’s stock, and how that process works. It’s also a great illustration of the backstabbing of women by other women in the workplace–something feminists (including Sheryl “Lean In” Sandberg and her galpal Megyn Kelly) don’t want to admit or acknowledge. On the other hand, it does have a couple of bitter left-wing vibes to it–one of them feminist whining and the other, an obvious and open attack on capitalism. But it does show how rumors and various machinations can affect an IPO. 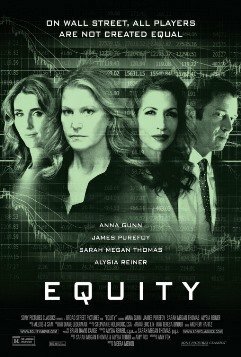 The story: Anna Gunn (“Breaking Bad”) plays a senior investment banker at a large, prestigious financial firm in San Francisco. She makes no apologies for her love of money at a women’s meeting of Stanford alumnae. But she’s also passed over for a large promotion at her company, a promotion she believes that she’s earned and which is long overdue. She’s told by her boss that she’s not seen as a “rainmaker” because she screwed up a previous IPO, and so she sets out to correct that notion. Gunn goes to a successful Facebook-esque social media company for which she found venture capital when the company began. Its CEO looks like a taller version of Mark Zuckerberg with longer hair and higher cheekbones. Gunn pitches the IPO to him and gets the business. But will the IPO be successful? That depends upon a rumor-free, error-free, leak-free media atmosphere, in order to get the share price to begin at a certain desired number in order to value the company at a point that will make everyone involved rich. And there’s the catch. Gunn’s boyfriend works on the trading side of her company. There’s supposed to be a “Chinese wall” between them, and she never shares insider tips with him. That would be illegal. But that doesn’t stop him from trying and pulling out all the stops. At the same time, Gunn’s old friend from Stanford Law School, Samantha (Alysia Reiner) is a federal prosecutor who recently joined the feds’ insider trading investigations. She’s digging into Gunn’s life and those of her colleagues. And she’ll go to any length to get information to nail somebody for insider trading. I could have done without the movie’s desperate, gratuitous, in-your-face pimping of her lesbian relationship, which had absolutely no connection to the plot at all. And then there’s Gunn’s right-hand woman, a junior VP named Erin Manning (Sarah Megan Thomas, who also co-wrote the script). She’s gunning for a promotion, but she’s also pregnant and trying to hide it. She is kind of sleazy and sketchy. As a thriller full of intrigue and a tutorial on how an IPO works, this is good. But I could have done without the liberal anti-capitalist and feminist vibes here. Still, it’s definitely entertaining. Thanks Debbie! I’ve wondered why you haven’t posted on here in a while, but I knew you were still doing radio movie reviews so I figured you had something you were working on. Can’t wait to hear what it is! Good morning to you Debbie. I’m glad that you’re doing ok and thank you for the movie reviews. I figured that you were doing something awesome to fight the good fight. I can’t wait to see what “ya got cookin’.” Speaking of movie reviews how do you feel about that dreck produced by John Legend(in his own mind) about the Obamas. The liberal lofos are lapping it up like it’s free Kool-Aid. I’ve gone through several barf bags just listening to the fawning from my relatives alone. I’m glad that you’re back, Debbie. Like Sean M, I saw that you made some occasional tweets and did your radio movie reviews, so I also figured that you had a very busy schedule–maybe working on a major project-which you indicated here that you have indeed been doing. Good that you are back and in form on these reviews. Hope your upcoming project works out.